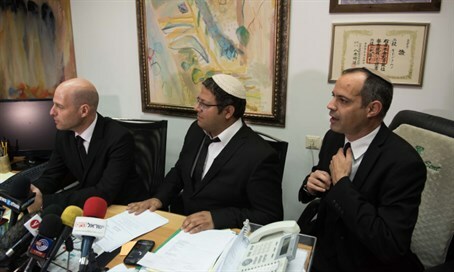 Attorneys Adi Keidar, Chai Haber and Itamar Ben-Gvir held a press conference on Thursday to discuss what they call serious breaches of law being committed in the investigation of Jewish youths suspected of possible involved in the lethal Duma arson. Keidar began by noting a partial gag order was lifted on Thursday, allowing it to be known publicly that several suspects are being held but not releasing any information as to identity - except that they are Jews. They were arrested at different times and are nearly all being prevented from meeting with their lawyers. "We held this press conference because...during the last week during the arrest of all the suspects the conduct of the security sources, police, Shabak (Israel Security Agency - ed. ), the attorney's office, and I daresay even the court, was one of the worst examples of conduct in terms of the breach of human rights, the rights of suspects, and constitutional rights that in the past the courts treated as things that could not be touched," charged Keidar. "The police, the attorney's office and the Shabak this week crossed every red line, conducted procedures that were never conducted in the state of Israel," he added. Testimony has come forward of Shabak agents brutally beating the suspects during their arrest and hiding video evidence of the assault, and arresting a nurse who is the sister of one suspect while she was working at a hospital. The father of one suspect testified that his son was in Tzfat (Safed) at the time of the attack together with another suspect. Calling the conduct of the authorities "intolerable," Keidar said it doesn't matter what the result of the investigation will be, because the serious nature of how the investigation is being conducted is such that "the moment the public is exposed to it, they will forget the murder and raise the question marks we've been raising this entire week." "In the coming days you will be exposed to decisions that no legal eye could approve," vowed the attorney. "The arrest warrants that we received are deceitful arrest warrants, they presented particular figures to the defense attorney, and the true figures - afterwards they admitted this - were figures that led the defense attorney astray," stated Keidar in a particularly damning revelation. "Not only are they not letting us represent (our clients) properly, they are also trying to cause us to fail. I'm saying things that are written in the protocol. There are investigative sources who deceived, and lied, and distorted, and the court - maybe its hand shook, but it accepted this message even though the people managing the investigation who know exactly and directly what happened weren't even standing before it." "That's what I'm saying and that's what I said in the protocol. Some day you'll see these protocols," concluded Keidar. Haber then spoke, saying, "we've been conducting for roughly eight days a sort of war, a war of attrition...we are just asking for one thing: to give the attorneys the possibility to represent, even in the most minimal manner, the suspect's case." "We must remember these are suspects, they are not accused, no indictments are visible on the horizon, even on the far horizon," he said, indicating the vague nature of suspicions against the youths. Haber condemned the "heavy-handed, violent" investigation, in which lawyers and the families of suspects are not being given the possibility to speak or see them. "All of this is meant only to try and get confessions out of people by force," he said. "We receive indications of lengthy hours of interrogation, sometimes beyond what the law allows, detainment in substandard conditions, not giving required medical treatment, and not giving food in a fixed and appropriate manner." The attorney noted that "in all the years we've been representing suspects we've never come across conduct like this." "My client needs medical treatment"
Attorney Ben-Gvir then took the microphone, saying, "during the arrest of my client, according to the testimony of his wife, he was beaten, bruised and wounded, he needs medical treatment." "It's no coincidence that today the general security services didn't bring him to the court," he charged, indicating the authorities sought to hide his medical condition. "We argue that they are hiding my client in the investigation rooms of the general security services. We argue that they are submitting them to severe pressure." "I understand the motivation of the general security services in the investigation, I understand that this is an investigation in which politicians got involved and said 'we want guilty people at any price.' But it cannot be that they make people disappear in the state of Israel. We are not in Argentina!," he emphasized. "And my greatest disappointment perhaps, more than the rest, is that some of the judges are following the lead of the system. I express my surprise at the decision of Judge (Yoram) Danziger about the conduct of some of the judges in the case, and I say as clearly as possible that the feeling is that they want a confession here at any price, the feeling is that the Shabak will do anything and everything in order to obtain some sort of achievement." Ben-Gvir said sternly, "this is serious. This is not fitting. A democratic state does not work like this." "And I ask myself where are all those who speak highly about democracy, about human rights, where are the leftists who defend every abominable terrorist who is arrested? Where have they suddenly disappeared to? It can't be that in the state of Israel they make people disappear in the basement of the general security services headquarters and no one opens their mouth." Criticism over the handling of the case gained steam after Defense Minister Moshe Ya'alon (Likud) publicly announced in September that the identities of the arsonists were known to Israel. However, just a month later in October, Prime Minister Binyamin Netanyahu admitted the arsonists or proof in the case hadn't been found yet.